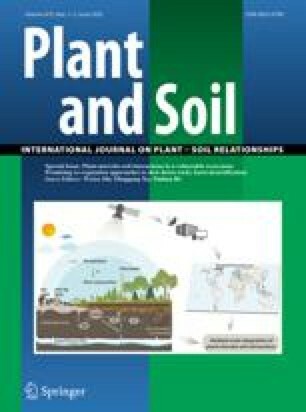 Mycelial inocula of the two ectomycorrhizal fungi,Pisolithus tinctorius (Pt) andThelephora terrestris (Tt) were artificially introduced into fumigated nursery soil before seed sowing. At the end of the first growing season, Pt stimulated the height growth ofPinus densiflora, P. thunbergii, P. rigida, andP. rigida×taeda by 55, 36, 69, and 37%, respectively, compared with control seedlings (with no fumigation and no inoculation). When growth stimulation was expressed by dry weight, Pt increased dry weight ofP. densiflora andP. rigida×taeda by 143% and 128%, respectively, over control seedlings. Total absorption (per plant top) of nitrogen and phosphorus of inoculatedP. densiflora seedlings was also increased by 188 and 144%, respectively, even though the concentration of these two elements in the tissue was not significantly different from that of control seedlings. Tt failed to stimulate growth of the inoculated plants possibly due to its lower level of infection (40–60% mycorrhizal tips) compared with the relatively high infection (over 80%) of Pt.Pinus koraiensis did not respond to inoculation during the first growing season, probably due to its inherent characteristics of producing a small number of short roots and its slow shoot growth during the first few years after germination. This study was supported by the International Foundation for Science in Stockholm, Sweden.